Have you ever had an ad that was a complete dud? Have you ever sunk a ton of money into a campaign and the phone never rang? You're not alone, but there's a better way! 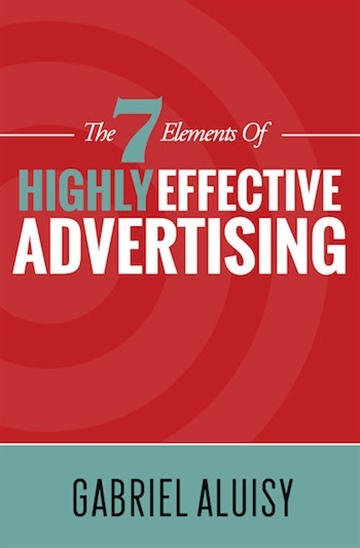 This book teaches entrepreneurs and managers an effective step-by-step process of creating advertisements that hook customers and generate more sales. You'll learn the different ad types, their effect in the different stages of the sales cycle and the best scenarios in which to use them. Along the way, readers will learn the benefits of split testing, creating focus groups, tracking results and the personality traits of people across generational divides. Whether you're creating pay per click ads, email campaigns, billboards or magazine spreads, the principles and techniques taught in this book will apply. Bonus content includes links to downloadable worksheets and tools that will enhance your learning experience as you follow the steps in this book. Gabriel Aluisy is the founder of Shake Creative, an award-winning branding and design agency based in Tampa, Florida focused on helping private clubs and luxury lifestyle brands build revenue and connect with consumers. He received his bachelor of arts from American University’s School of Communication in Washington, DC where he studied Visual Media. He has designed and developed marketing campaigns and brand collateral for over 1,000 companies including national franchises and brands. His work has won awards, but more importantly, has generated millions of dollars of revenue for his clients. He is the bestselling author of Moving Targets, Creating Engaging Brands in an On-Demand World and he is also the host of the Branding Podcast, a weekly internet radio show that helps entrepreneurs and startup founders create loyal followings for their brands. Gabriel has been featured in leading publications such as Entrepreneur®, and is regularly a guest on radio, television and blogs. He is passionate about art & design, golf, travel and preserving the world’s indigenous cultures & languages.